Discussion in 'Commercial Building Codes' started by tuzi, Jul 24, 2018. I have a floor plate with R2, S-2, and A-2. The aggregate area of S-2 and A-2 are over 10% of the floor plate. If I take the floor as un-separated occupancies, then I know I have to follow 20' dead end as A-2 is the more stringent. I am wondering if I separate A-2 from the rest of the floor with 1-hour fire barrier with 45 min. door, does it mean max. 50' dead end corridor for R-2 will apply or it's not the case unless aggregate area of S-2 and A-2 is under 10%? 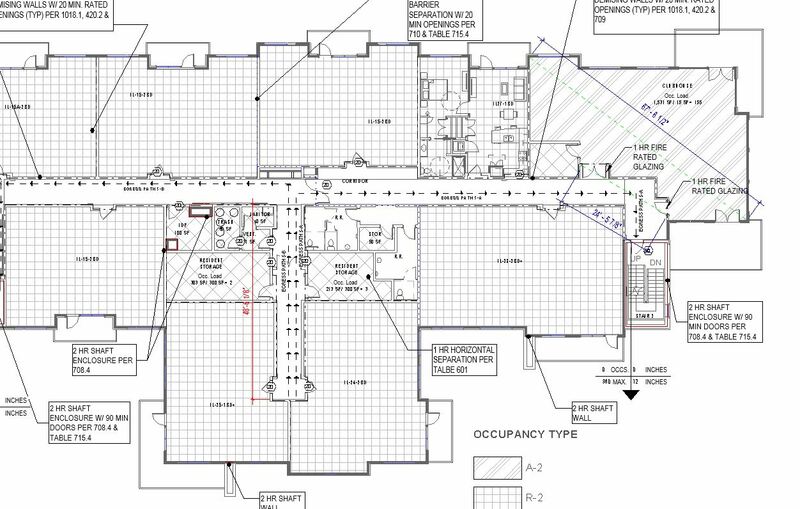 If a corridor is serving an assembly occupancy, then you're limited to the 20-foot limit on dead-end corridors, regardless of whether or not the assembly occupancy is an accessory use. Accessory uses are still classified per the applicable occupancy group, the main exception is that you do not have to separate the accessory occupancies from the main occupancy, but all other code provisions applicable to those accessory occupancies are still required. 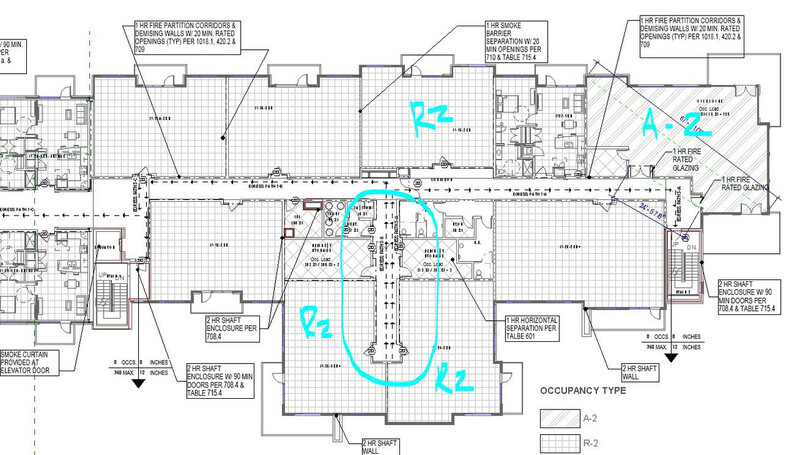 The corridor I circled only serves the R2, does it mean it could be max. 50 ft, although I have A-2 on this level? The image didn't come through, but if the corridor is only serving the Group R, then yes, the longer distance for a dead end corridor would be permitted. While waiting for the floor plan. Are you required two means of exit ?? Add a door across the corridor in the dead end. Not sure if you put it on a mag door holder, if it is still legal???? That's what I did now, but I just wonder if code allows without the door. So what is the measurement of the dead end?? I am at 48'-6". I can reduce it to under 20' by adding a door in the corridor. Yeah, I think I need to add the door. We have the unlimited plan, keep asking questions till you get an answer you like!!! Why can't you shift the doorways 20 feet forward and increase the apartment square footage?